The Dragon fountain of Paris is certainly one of the most surprising monuments found in the French capital… On this post I’m telling you a bit more about this intriguing feature partly hidden in the 13th arrondissement. A monumental fountain that refers to the energy of the water drawn from the Seine to supply the French capital. Watch out the Dragon fountain of Paris! The real name for the Dragon fountain is La danse de la fontaine émergente (Dance of the emerging fountain). It was designed by French-Chinese artist Chen Zhen (1955-2000) on the site of a former water-control facility (the Seine is not far at all from the square!) The water-production plant was rebuilt underground in 1994 to filter non-drinkable water from the Seine for the supply of the city’s parks and the streets’ piping system. 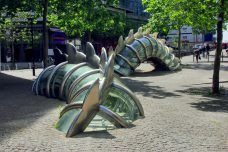 The monumental fountain takes the shape of a dragon which body emerges and submerges from the ground at regular spaces. From the distance, the feature looks intriguing as it seems to wind its way around the square. If you take a closer look at the Dragon fountain, you’ll notice that it comprises three parts. On the wall, a bas-relief seems to emerge from the water-supply plant wall before plunging underground. As for the two other parts, they represent the body of the dragon with its scales forming an arch out of the ground. And don’t look for the head: it is hiding somewhere under your feet! Your imagination will do the trick! 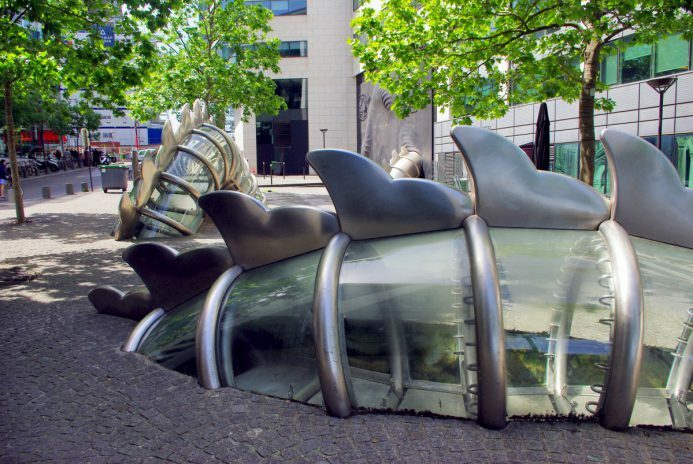 The Dragon fountain consists of stainless steel, glass and plastic. This ingenious concept makes it transparent so you can see the water flowing within the structure. 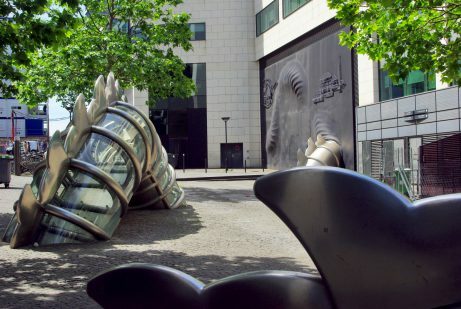 The City of Paris commissioned the monument in 1999 from sculptor Chen Zhen. After his death in 2000, his wife Xu Min took over the project. The inauguration of the Dragon fountain took place on the 12th February 2008. Where to find the Dragon fountain of Paris? Location: Place Augusta Holmes (off rue Paul-Klee), 13th arrondissement. The square is part of the new neighbourhood of Paris Rive Gauche. 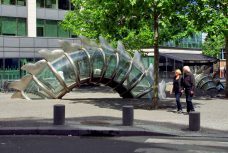 Extending from Gare d’Austerlitz to the Boulevard Périphérique at Ivry-sur-Seine, the district has undergone radical transformation over the past 30 years.